The Pilot Ageless line comprises high quality pens with a patented two staged twist mechanism that completely retracts the pen tip. They come in two flavors: gel and ballpoint (the refills are not interchangeable). There are two barrel options that come in a variety of colors, the Future has a metal barrel with a silver grip section and the Presence has a plastic body with a translucent grey grip section. The design of the pen is nice and clean and is great for pockets as the tip completely retracts; no more getting stabbed by your pen. I like the Carbon Grey body of the Future which looks and feels high quality. The clip is small but strong. The Future is nicely weighted without being too heavy. The Ageless Gel is one of the smoothest gel pens I have used. The refills only come in fine 0.7mm with blue or black ink and they aren’t that cheap; a pack of 12 costs $37 (about $3 a refill). The fine 0.7mm line is on the fatter side and the ink doesn’t look that sharp but I do enjoy writing with this pen and I can’t say that about many gel pens. The pen comes in a white tube which works as a storage box as well as a pen stand. 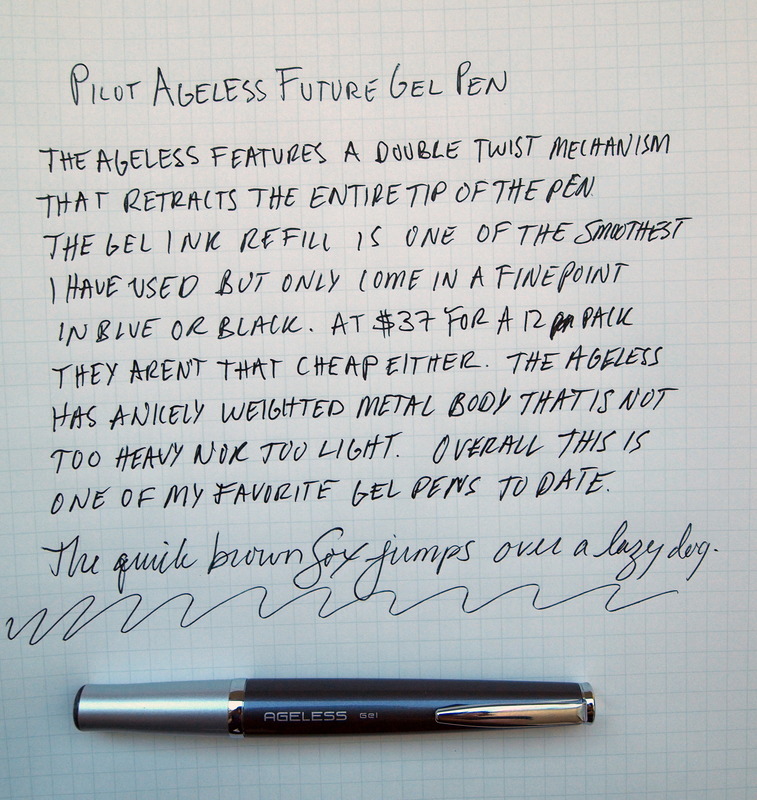 The Pilot Ageless Future Gel makes a really nice gift for someone who wants a great everyday pen.